This is the full copy of our afternoon advisory on September 9th. Both our recommended trades hit that day and were a success. Please contact me if you would like any information on how to subscribe. The Advisory is composed of 3 sections, the Short Term, Intermediate Term and Interest Rate Outlook. We frequently provide advisory trade parameters on our advisory. 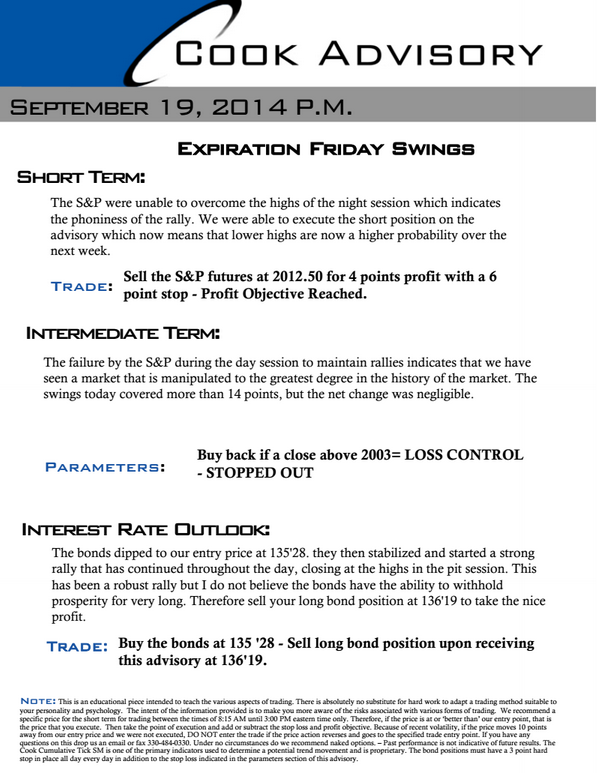 Here is an example of the Wednesday trade that was achieved. Once again if you are interested please contact us and check out the Advisory Service Button for more details. *Please note that past performances do NOT indicate future. He is an excerpt from Monday's advisory. Please reach out to us if you are interested in subscribing. We will continue to do this to give you a taste of how it operates.